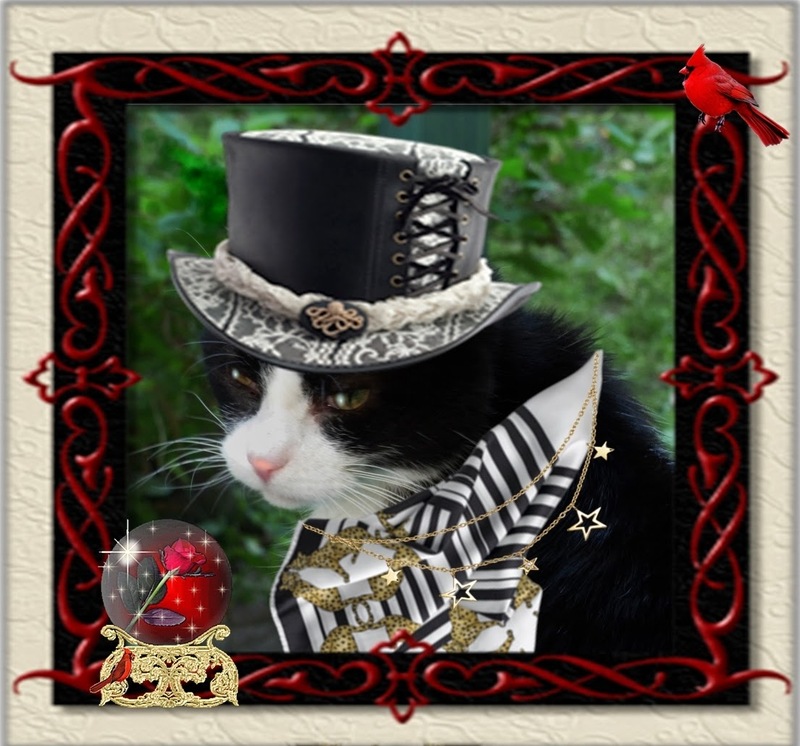 Wendy's 3-D Cats: 3-D TOP HAT TUESDAY! My 3-Ds think nothing can top this! Top hats are definitely made for top cats, and Domino, Dylan and Dante certainly qualify. Domino is wearing a steampunk-style ladies' top hat in black leather, white lace and string laces. She's in a romantic mood. And while the stars may not be in her eyes, her thoughts are of her loved one so many miles away -- on the other side of the globe. The red rose predicts a lovefest in the near future, and the cardinal also represents passion and warmth as a totem symbol. 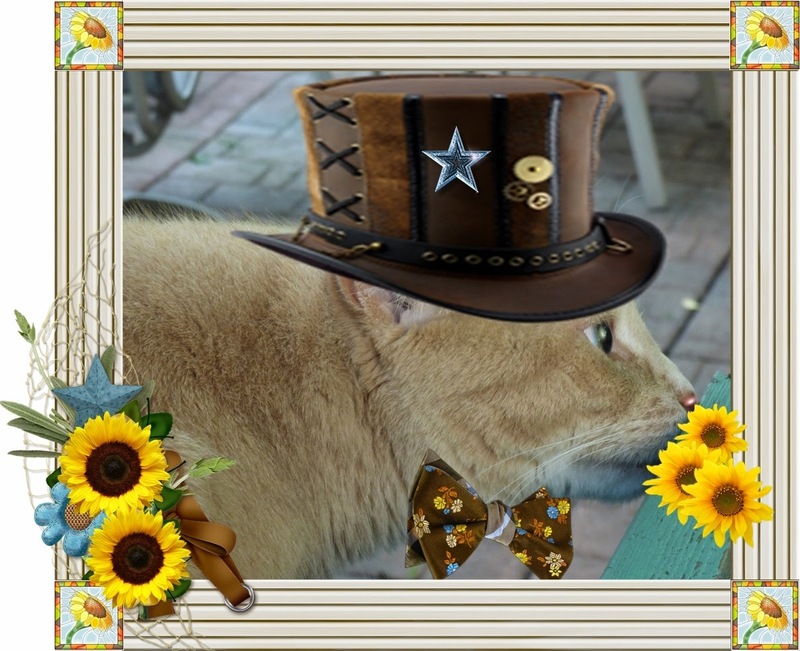 Dylan is also decked out in a steampunk top hat along with a coordinating bowtie. His sniffer is in top form, too, as he susses out some sunflowers. The bright yellow flower, although not highly scented, brings with it a sense of warmth and happiness. "I sees nuffin but sunneh days ahead", says Dylan. Dante's in a daze, in a field of white daisies and surrounded by a slew of butterflies. 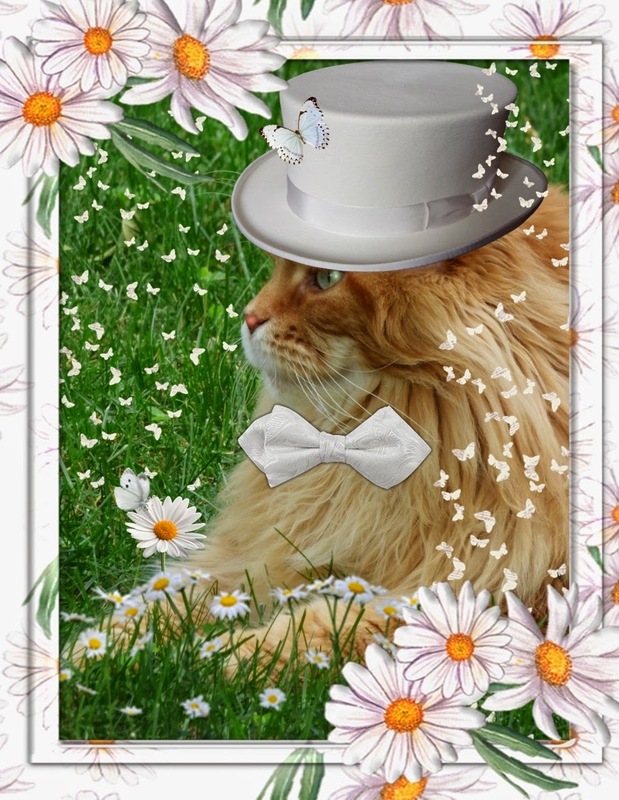 Appropriately enough he's wearing a pure white top hat and tie, although his tail is still it's normal ginger. "Somehow, I know now dat efurryfin's gonna be all wite -- at leest for da foreseeabull future! ", says he. Top of the day to you all!